This paper describes a method for producing submicron high-purity alumina. In this method amorphous basic aluminum sulfate (BAS) was prepared by homogeneous precipitation of aluminum bisulfite solution containing chitosan. This cationic polymeric compound was used as an electrosteric dispersant. Submicron BAS was derived from an aluminum bisulfite solution (0.4 M in aluminum). The BAS powder was transformed into crystalline basic ammonium aluminum carbonate (ammonium dawsonite) by treating BAS with 1 M ammonium carbonate solution at 60°C for 4 h. Alpha alumina with mean particle size of 0.42 μm was obtained by heating ammonium dawsonite at 1150°C for 1 h.
Alumina generally is one of the chemically purest ceramic powders commercially available with submicron particle size. Submicron BAS has been proposed as alpha alumina precursor because of its purity and spherical morphology . Submicron BAS has been prepared by homogeneous precipitation of aluminum sulfate with urea a precipitating agent [2-4]. In another method, formamide was used to precipitate BAS at a lower pH than urea in order to obtain high purity BAS . Enzymatic decomposition of urea at low temperature has been recently proposed to obtain BAS with monodispersed spherical particles . Submicron alpha alumina has been prepared by heating BAS in the range 1050°C to 1300°C. When BAS was heated up to 1300°C, it decomposed evolving sulfur trioxide to the atmosphere. Furthermore, undesirable hard agglomerates were formed due to the high calcination temperature . The purity of alpha alumina obtained from BAS depended on the chemical purity of the precursor aluminum salt and precipitating agents, in addition to the conditions of the precipitation process. Blendell et al. obtained high purity alumina containing only sodium, iron and gallium above 10 μg/g on a cation basis. In this case, a high sodium level was present in the starting material, aluminum sulfate, and was not separated by precipitation. On the other hand, a high purity alumina was obtained by using a high-purity form of recrystallized aluminum salts (sulfates, chlorides, nitrates). When a pure recrystallized ammonium alum was calcined, a 99.99% pure, fine crystalline alumina was obtained . Therefore, high purity alpha alumina can be obtained by using high purity ammonium aluminum sulfate as BAS precursor, instead of aluminum sulfate. In this work, ammonium aluminum sulfate is used as a precursor of BAS and biopolymer “chitosan” is used as electrosteric dispersant in the precipitation process to prevent BAS agglomeration. Furthermore, BAS is transformed into crystalline basic ammonium aluminum carbonate (ammonium dawsonite) in order to eliminate the sulfate and to avoid the formation of hard agglomerates, caused by heating the precursor at high temperature. Ammonium dawsonite is obtained by treating SBA with aqueous ammonium carbonate at 60°C. The compound is characterized by X-ray diffractometry (XRD) and Fourier transform infrared (FTIR) spectroscopy. The BAS used in this work was prepared by precipitation in homogeneous solution by heating an aqueous solution of aluminum bisulfite (0.4 M in aluminum) and chitosan (1.0 wt%). The aluminum bisulfite solution was prepared by dissolving previously precipitated basic aluminum sulfate with sulfur dioxide in aqueous media. All chemicals used in this study were reagent-grade products from J. T. Baker. The ammonium carbonate (AC) solution was prepared by mixing appropriate amounts of ammonium bicarbonate and ammonium hydroxide so that the final concentration of both reactants in solution was 1.005 M.
The formation of crystalline basic ammonium aluminum carbonate was studied by mixing BAS with varying amounts of ammonium carbonate solution, and heating the samples at 60°C for 6 h, in a water bath. The solids were separated from the supernatant liquid via vacuum filtration. Then, the solids were dried at 70°C for 24 h prior to analysis by FTIR spectroscopy. The crystallization rate of ammonium dawsonite was determined by pouring 1.5 g of BAS and 14 ml AC solution in an Erlenmeyer flask. The suspension was heated in a water bath at 60°C, for 1, 2, and 3 h. The solids were separated from the supernatant liquid via vacuum filtration and dried at 60°C for 24 h before analysis by FTIR spectroscopy. The phase transformation sequence during ammonium dawsonite calcination was determined. One gram of sample powder was put in platinum crucibles and was heated at different temperatures, for 30 min. 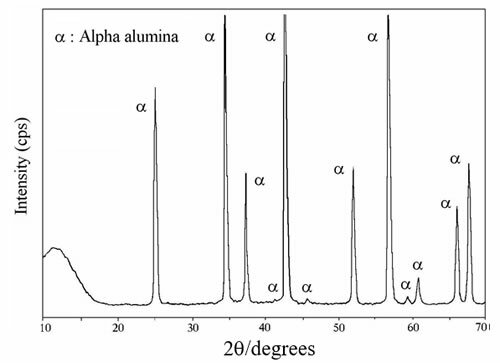 The crystalline phases of alumina in the calcined samples were determined by FTIR spectroscopy and XRD. Alpha alumina was prepared by heating ammonium dawsonite at 1150°C, for 60 min. The powder was attrition milled for 2 h, before particle size analysis. The solids were characterized by XRD (Model D-500, Siemens, Germany) using Ni-filtered CuKα radiation. Infrared analysis was performed using KBr pellets and the samples were run on a FTIR spectrometer (Model 1600 series FTIR, Perkin Elmer, Norwalk, Connecticut, USA). The median particle size and the particle size distribution of the powder were determined by particle size analyzer (Model LA-300, Horiba, Irvine, California, USA). The XRD pattern of precursor BAS (not shown) shows that the solid is amorphous. 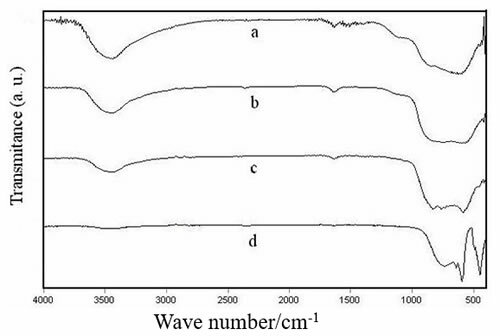 The FTIR spectrum of BAS (Figure 1) indicates that the compound was a hydrate, because of the strong and broad absorption band in the region from 3000 to 3700 cm-1 and the absorption band which peaks at 1655 cm-1 [9,10]. Furthermore, the strong and broad band centered at 1135 cm-1 and the small shoulder at 998 cm-1 could been attributed to sulfate absorptions (ν3) and (ν1) respectively [9-11]. The strong and broad absorption band centered at 613 cm-1 probably resulted from the combined absorptions of sulfate (ν4), the Al-O stretching vibrations and the Al-OH wagging vibrational mode of molecular water [9,10]. Therefore this hydrated basic aluminum sulfate is very similar to that obtained and studied by Brace and Matijevic  and Saks . Chitosan phase was not detected by FTIR. The FTIR spectrum only shows absorption bands corresponding to a basic aluminum sulfate. Figure 1 shows the FTIR spectrum of the sample obtained by the reaction of BAS with 10 ml of ammonium carbonate in aqueous medium at 60°C for 6 h (curve 1b). The FTIR spectrum for 1b powder shows a decrease in the υ3 sulfate absorption peak at 1135 cm-1, indicating that partial sulfate elimination has occurred. Furthermore, small absorption peaks in the range 1500-1400 cm-1 corresponding to carbonate can be seen . Therefore, the conversion from BAS to ammonium dawsonite occurred through an intermediary amorphous basic aluminum carbonate. Figure 1. 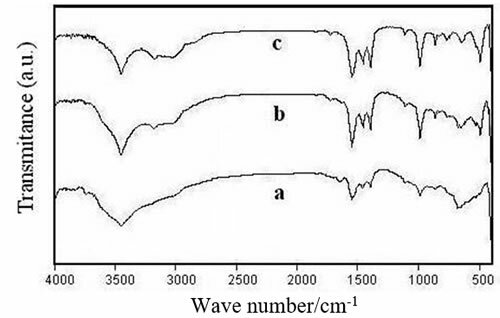 FTIR spectra corresponding to (a) BAS, and (b) BAS treated with 10 ml of ammonium carbonate solution at 60°C for 6 h.
When 11 ml AC solution are added, dawsonite crystallization begins (Figure 2a). The FTIR spectrum shows small dawsonite absorption peaks, whose intensity gradually increases with AC concentration, indicating that extensive crystallization has occurred at high AC concentration. The solid corresponding to 2c spectrum is primarily ammonium dawsonite . Figure 2. 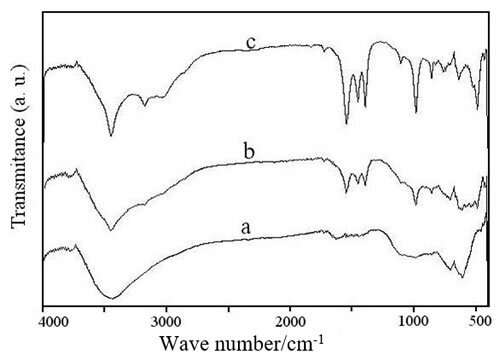 FTIR spectra corresponding to basic aluminum sulfate treated with various amounts of ammonium carbonate solution (a) 11 ml, (b) 12 ml, and (c) 14 ml, at 60°C for 6 h.
The previous work showed that the particle morphology of BAS was maintained until dawsonite crystallization . When dawsonite crystallization occurs, the particle morphology changes from spherical to acicular. Figure 3 shows the FTIR spectra for SBA samples treated with 14 ml of AC solution at 60°C, for 1, 2 and 3h. The sample heated for 1 h displays broad peaks corresponding to an amorphous phase that contains a small amount of sulfate (Figure 3a). Dawsonite content increases with heating time (Figures 3b and 3c). The FTIR spectrum for the last sample (Figure 3c) shows well defined dawsonite absorption peaks. Therefore, dawsonite crystallization is completed after 3h at 60°C. Figure 3. 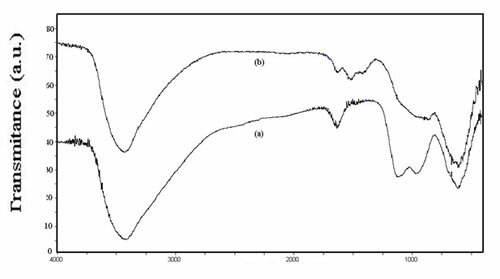 FTIR spectra of basic aluminum sulfate treated with 14 ml of ammonium carbonate solution at 60°C, for: (a) 1h, (b) 2h, and (c) 3h. The ammonium dawsonite was prepared by treating 1.5 g of BAS with 14 ml of AC solution at 60°C for 4h. The phase transformation phase sequence was determined by heating dawsonite samples at 400°C, 800°C, 1000°C and 1150°C, for 30 min. Figure 4 presents the XRD spectra corresponding to samples heated at different temperatures. The phase transformation sequence from BAS to alpha alumina is: amorphous, gamma-, theta- and alpha-alumina. This result is confirmed by FTIR analysis as shown in Figure 5. It should be mentioned that alpha alumina can be obtained by heating ammonium dawsonite at 1130°C, whereas BAS must be heated at 1250°C for obtaining the alpha alumina phase. Figure 4. XRD patterns of ammonium dawsonite heated at various temperatures for 30 min: (a) 400°C, (b) 800°C, (c) 1000°C, and (d) 1150°C. Figure 5. FTIR spectra of the solids obtained by heating ammonium dawsonite at several temperatures for 30 min: (a) 400°C, (b) 800°C, (c) 1000°C, and (d) 1150°C. Alpha alumina was prepared by heating ammonium dawsonite at 1150°C for 60 min. The XRD pattern in Figure 6 shows that the calcined material is alpha alumina. The powder contains soft agglomerates and it can be milled easily. 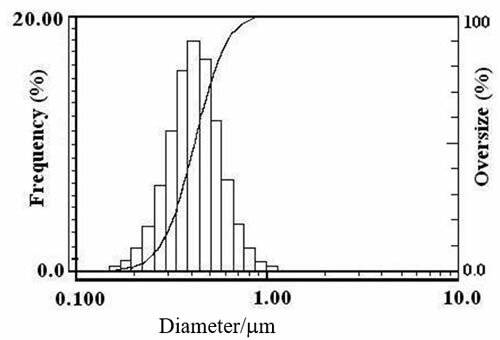 After attrition milling for 2 h the powder consists of the alpha alumina particles with the median particle size of 0.42 μm as shown in Figure 7. Figure 6. XDR pattern corresponding to ammonium dawsonite heated at 1150°C for 60 min. Figure 7. Particle size distribution of alpha alumina prepared by heating ammonium dawsonite at 1150°C for 60 min, and attrition milled for 2 h.
Basic aluminum sulfate (BAS) was transformed into ammonium aluminum hydroxide carbonate (ammonium dawsonite) by reacting BAS with ammonium carbonate solution at 60°C, for 3 h. The conversion from BAS to ammonium dawsonite occurred through intermediary amorphous basic aluminum carbonate. The phase transformation sequence from ammonium dawsonite to alpha alumina was: amorphous, gamma-, theta- and alpha-alumina. Alpha alumina crystallization occurred at 1130°C. By heating ammonium dawsonite at 1150°C for 60 min, alpha alumina could be obtained with median particle size of 0.42 μm. The authors thank Mr. M. C. Fernando de Jesús Amézquita L. for FTIR, Ms. M. C. Yolanda Gallaga for DRX, and Mr. Juan Balderas P., for their technical assistance. 1. Alan Bleir, “Colloidal Properties of Alumina”, in Alumina Chemicals Science and Technology Handbook, (Ed. L. D. Hart and E. Lense), American Ceramic Society, Westerville, Ohio, (1990) pp.41-48. 2. R. Brace and E. Matijevic, ”Aluminum Hydrous Oxide Sols I: Sphericles of Narrow Size Distribution.” J. Inorg. Nucl. Chem., 35 (1973) 3691-3705. 3. E. Matijevic, “Preparation and Characterization of Monodispersed Metal Hydrous Oxide Sols,” Progress in colloid and Polymer Science, 61 (1976) 24-35. 4. B. C. Cornilsen and J. S. Reed, “Homogeneous Precipitation of Basic Aluminum Salts as Precursors for Alumina,” Ceramic Bulletin, 58  (1979) 1199. 5. J. E. Blendell, H. K. Bowen and R. L. Coble, “High Purity Alumina by Controlled Precipitation from Aluminum Sulfate Solutions,” Ceramic Bulletin, 63  (1984) 797-801. 6. R. E. Simpsom II, C. Habeger, A. Rabinovich and J. H. Adair, “Enzyme-Catalyzed Inorganic Precipitation of Aluminum Basic Sulfate,” J. Am. Ceram. Soc., 81  (1998) 1377-79. 7. M. D. Sacks, T-Y. Tseng and S.Y. Lee. “Thermal Decomposition of Spherical Hydrated Basic Aluminum Sulfate,” Ceramic Bulletin, 63  (1984) 301-310. 8. T. J. Carbone, “Production Process, Properties, and Applications for Calcined and High-Purity Aluminas,” in Alumina Chemicals Science and Technology Handbook, (Ed. L. D. Hart and E. Lense), American Ceramic Society, Westerville, Ohio, (1990) pp.103-105. 9. R. A. Nyquist and R. O. Kagel, “Infrared Spectra of Inorganic Compounds,” Academic Press, New York, (1971). 10. K. Nakamoto, “Infrared and Raman Spectra of Inorganic and Coordination Compounds,” Wiley, New York, (1978). 11. C. J. Serna, J. L. White and S. L. Hem, “Anion-Aluminum Hydroxide Interactions,” Soil Sci. Soc. Am. J., 41 (1977) 1009-1013. 12. M. D. Sacks, T-Y. Tseng and S. Y. Lee. “Thermal Decomposition of Spherical Hydrated Basic Aluminum Sulfate,” Ceramic Bulletin, 63  (1984) 301-310. 13. C. J. Serna, J. L. White and S. L. Hem, “Structural Survey of Carbonate-Containing Antacids,” Journal of Pharmaceutical Sciences, 67  (1978) 324-327. 14. J. Serna and J. L. White, “Hydrolysis of Aluminum-Tri-(Sec-Butoxide) in Ionic and Nonionic Media,” Clays and Clay Minerals, 25 (1977) 384-391. 15. 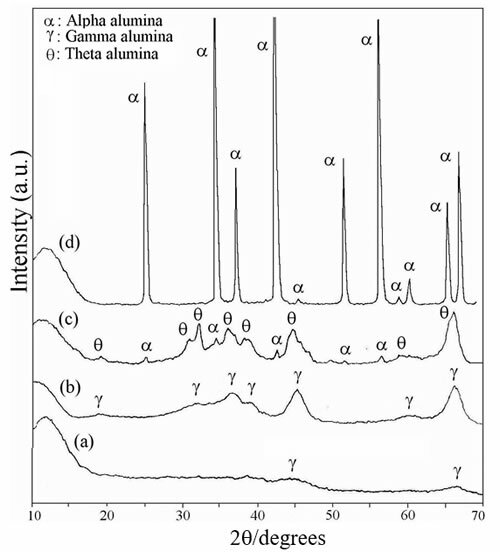 C. A. Contreras, E. Ramos, S. Sugita and J. Serrato, “Aluminum Carbonate as an Alumina Precursor,” in press, (Ceramic Transactions (2003), American Ceramic Society, Westerville, Ohio. Guerrero y Progreso s/n, Monterrey N. L.
This paper was also published in print form in “Advances in Technology of Materials and Materials Processing”, 5 (2003) 36-39.